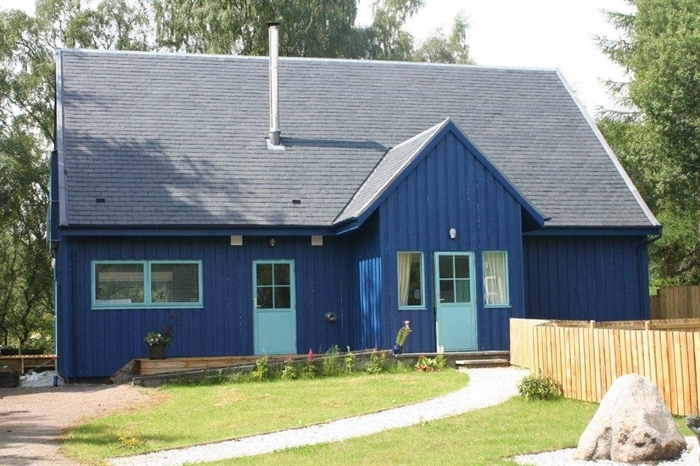 Ptarmigan: Three bedroom cottage with disabled wet room/toilet, bathroom and ensuite shower. Newly built to high standard. Wood burning stove. Views to Cairngorm Mountain. 3 Star VisitScotland rating. Five bedroom cottage recently completed to high specification throughout. Disabled toilet and wet room. Easy access to Aviemore and Cairngorms Mountain Resort. 3 Star VisitScotland rating. Adjacent private parking with ramp to main doors. Nearby is the RSPB Reserve at Loch Garten where Ospreys nest and can be viewed in the wild. 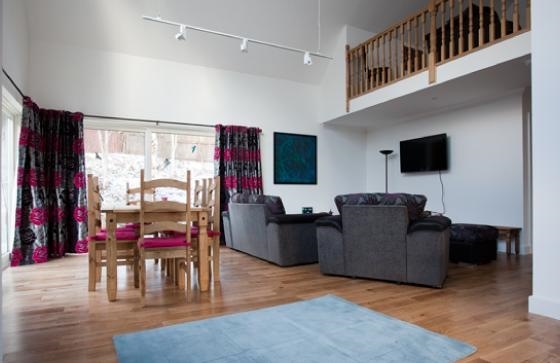 The cottages are situated in a quiet hamlet at Chapleton, a mile from Boat of Garten, 5 miles from Aviemore adjacent to cycle route 7 off road to Carrbridge within the Cairngorms National Park. Open outlook onto woodland with views over to the Cairngorms. Recently completed on existing site of Conifer Cottages. Furnished to a high standard throughout with oil fired central heating or underfloor heating and wood burning stove. Open plan kitchens and dining areas with patio doors leading to decking with furniture and BBQ. The houses have been designed to accommodate disabled access. Both properties are very spacious throughout. Bathrooms on ground floors are spacious wet rooms offering excellent facilities for wheelchair users. Three bedrooms. Master bedroom has a king sized bed and ensuite powered shower. The other two rooms are twin bedded. Flat screen TV and DVD in main lounge with second flat screen TV in downstairs dining area. Five bedrooms, one with king sized bed and four rooms twin bedded. Two rooms have ensuite with a power shower in one. Flat screen TV's and DVD players in lounge and adjacent dining area. Card table and table football in lounge. Boat of Garten is a mile away with access to local shop, post office and restaurants. It is also home to the Strathspey Railway. Golf, fishing, Speysideway and woodland walks nearby. Pets are welcome but cottages are strictly NON SMOKING. Good location for touring the Highlands with Inverness and Loch Ness less than an hour away.